ALWAYS POWER ON, NEVER OFFLINE. 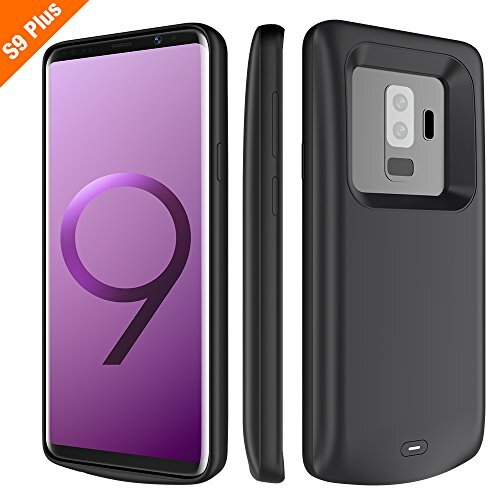 BrexLink External Protective Portable Charger Battery Case Power Pack is designed to improve the performance and battery life for your Samsung Galaxy S9 Plus. ★ When charging the battery case with phone attached, the phone battery will be charged first. After the phone battery is fully charged, charging of battery case will begin. ★ Please fully charge the battery case before your first use. 1. Build-in high-capacity lithium-polymer battery, double the standby time for your Samsung Galaxy S9 Plus. 2. Creative design, enjoy your phone without removing the battery case. 3. High class material to protect your phone, charging and protecting 2 in 1. 4. Integrated circuit design, effectively avoid short circuit or overtime charge even under extreme conditions of wrong operating. If there is any quality problem on our Samsung Galaxy S9 Plus charger case, Please let us know and you will be offered a full refund or replacement. Enjoy this absolutely RISK FREE purchase by clicking the yellow Add to Cart button. ★ 【PROVIDE 100% EXTRA BATTERY LIFE】: Built with a powerful 5200mAh Li-Polymer battery that can fully recharge your Samsung Galaxy S9 Plus in less than 2 hours. Get up to 100% more battery life. ★【FULL 360° PROTECTION】: Designed with an anti-slip pattern, raised bezel, cushioned frame and rugged outer-shell. Provides superior protection against drops, hard falls, and scratch. ★【PRIORITH PASS-THROUGH CHARGING】: Charge your phone without having to remove the case. Your device will receive a full charge and then begin to automatically recharge the battery case in less than 2 hours. ★【BUILT-IN SAFEGUARDS & OTG DATA TRANSFER】: Sophisticated temperature sensor prevents device from overheating and overcharging for safe and reliable fast charging. Equipped with OTG data transfer technology for easy data-synchronization without having to remove the case. ★【WARRANTY】: 30-Day Money-back Guarantee and Extended 18-Month Warranty. Upgrade to Lifetime Warranty by following us on social media. If you have any questions about this product by BrexLink, contact us by completing and submitting the form below. If you are looking for a specif part number, please include it with your message.